.We like Sonara so much that we kept her 2007 doeling, Bonnie. Sonara's final linear score was 91 (EEEE) !! 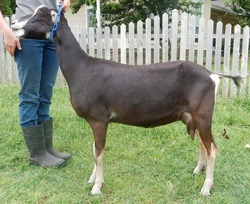 Sonara was a substantial doe with a beautiful mammary system, wide and high escutcheon, and a fabulous topline. Not to be outdone...Bonnie appraised at a 91 EEEE as a 4 year old. We are glad we waited for this girl to mature. 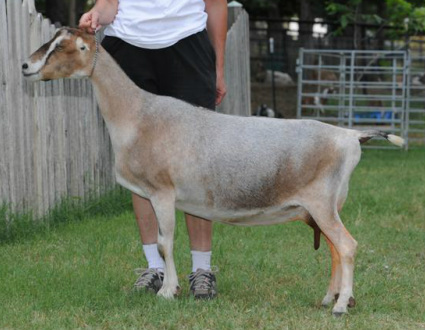 She became our second permanent CHAMPION lamancha in 2013. She and Sonara were part of our 1st place Dairy Herd and were 1st place Dam & Daughter at the 2011 Amarillo Tri-State fair! Bonnie has her mother’s personality, independent and feisty ! She has wonderful dairy character, smooth general appearance and a fabulous udder. As she matures she is clearly becoming the same kind of show-off that her mother was. In 2012 she got 2 Grand Champion legs toward her permanent Championship. 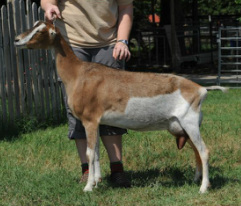 In 2013 Bonnie finished her permanent Championship in STYLE by going BEST DOE IN SHOW at the Texas-Oklahoma Fair. We have retained 2 daughters, both easily became champions. Sumthin' (LA90) from 2010 & Deja Vu (LA90). We love the consistency we see in this entire line. Family of BEST UDDERS !